The Horace Reed House at 94 Oakland place is a freely rendered example of the Colonial Revival style, which was very popular in the mid-1890s. This substantial two-story house features a porch with Ionic columns; the porch covers only half the width of the house to allow more light to enter the first floor. Numerous bays and oriels project from the rectangular body of the home. The first story is constructed of buff-colored Roman brick with raised mortar joints; the original color is still visible at the chimney tops, but the rest of the brickwork was painted years ago. Subtle features of the first story include a battered base and elongated brick flat arches above the windows instead of the usual lintels. The second story is constructed of clapboards that gently flare out at the top of the first story. There is fine detailing on the oriels and the small brackets form a dentil course under the eaves. The hipped roof with flaring eaves is punctuated by numerous dormers with the same flaring rooflines; towering chimneys visually anchor the entire composition. The front door opens into a vestibule with a beautiful mosaic floor; this leads to the stair hall, from which all of the home's principal rooms append. The detailing in the stair hall is Gothic, and it is most pronounced in the foliate-carved newels and tracery-like balustrade. The reception room, located just off the entrance to the stair hall, is the exquisite jewel of the house. It is richly embellished with dainty Corinthian pilasters and other delicate neoclassical woodwork. The grand living room, which is dominated by a large hearth, and the luxurious mahogany dining room also flank the stair hall. The library, which was added to the house in 1913, is located beyond the dining room. The upper sashes of the windows throughout the house are made of clear glass and delicate neoclassical leading and feature a different design in each room. 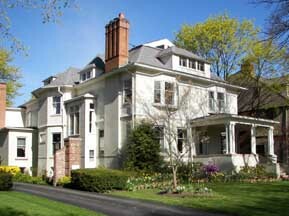 94 Oakland Place was built in 1894 for John J. McWilliams. McWilliams was the western sales agent for the Delaware, Lackawanna & Western Railroad Company. He had the house built as a wedding gift for his daughter, Mary, and her husband, Horace Reed. A native of Ohio, Reed had come to Buffalo to attend the Bryant & Stratton Business College; he then became the private secretary to William P. Northrup, a prominent local businessman. By 1900, the Reed household had grown to include three sons: John, Horace, and Carl. With two female servants also living in the house, space was tight so the house was extended to the rear in 1913. The centerpiece of the addition was a large room known as the library; it was often used as a dining room for formal occasions. At one such event, a later hostess had a little fun with her guests: when the cover of the main course was removed, a live duck emerged and waddled across the dinner table. The dinner guests were shocked and delighted with this surprise. Soon after moving into his new home, Horace Reed joined with his father-in-law and several other men to found the Niagara Lithograph Company in 1896. Reed was initially secretary and treasurer; he became president when McWilliams died in 1912 and he served in this capacity for more than forty years. The 1903 factory still stands at 1050 Niagara Street. After Reed's death in 1960, 94 Oakland Place was purchased by another Niagara Street businessman, George H. Hyde, president and treasurer of the Mentholatum Company.